Fly Fishing Guide School Best NC Smokies Fly Fishing Guide School Training One Week Course! North Carolina fly fishing guide school training is an all-encompassing educational week of improving your personal skills. Are you prepared for a career change as a fly fishing guide? The North Carolina fly fishing guide school training class is limited to 8-12 people (Google My Business Page). We also have one of the largest directories for job placement of where you wish to work which is provided for you at graduation from the class with top lodges and outfitters around the world. I think you will be hard-pressed to find any Fly Fishing Guide School in North America with 5 Casting Masters (FFI), 3 (ACA) whitewater rowing instructors, 3 Fly Fishing Team USA Members, 4 Fly Fishing Team USA Coaches, 1 Field and Stream Angler of the year, book and national magazine authors, and 2 Hall of Fame Inductees into the Southern Appalachian Fly Fishing Museum. Fly fishing is a prideful sport! I am just humbly stating the facts so you know the high level of professionalism! We offer the most advanced and qualified instructors period for covering the guide schools in the nation. Each of our instructors has a top-notch resume with the latest credentials for their discipline of study. This ensures you have the highest quality in the nation! The instructors for the school average over 240 years of total experience in the field! That is some serious credentials for teaching all aspects of the sport for the guide schools. Meet our fly fishing guide school instructors on the drop-down menu or click on the highlighted blue link. We have ensured that customers will have the highest level of instructional standards to any guide schools all over North America! North Carolina fly fishing guide school training is offered in the Spring and Fall every year. This is the only fly fishing guide school in the East. We have the longest seasons in the country due to the milder winters here in Western NC. The atmosphere revolves around an educational setting and definitely will peg your fun meter daily! The location will be in the beautiful location of the Smoky Mountains in the town of Bryson City, NC. 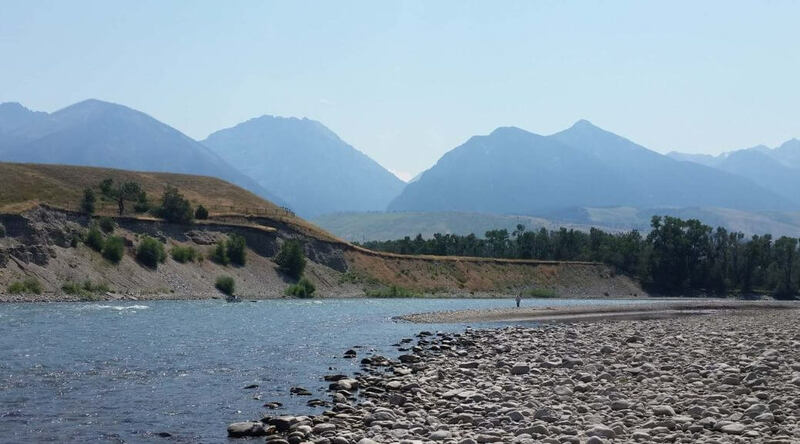 Wages landing your first job as a fly fishing guide working for an outfitter or lodge typically ranges between $2,400-$3,000 per month but amounts may be much higher if you remain an independent guide on your home water. Many take this up for the experience of being outdoors in a beautiful location. For others, it may be their pursuit of a lifestyle change. A vast supply (over 100) high-end fly rods with different actions are all available to try out while attending. Also, there are multiple tapers of different fly lines at your disposal. We also introduce you to the advantages of learning to fly cast the double-handed rods in addition to the single hand fly rods. Furthermore, the Switch and Spey casting open opportunities in fly fishing. All materials for fly tying are also provided to learn the techniques for developing your own confidence flies. In addition to water reading skills, casting diagnostics, boating skills, tactics, fly tying, angling techniques, rigging, you will also be certified during the week with CPR and First Aid. Having this certificate from an American Red Cross instructor will be a bonus because it fulfills a majority of outfitter requirements. Another bonus of group camaraderie is based on actual presentations and fishing time on the river for digesting and applying what you have learned. The biggest asset you will come away with is the skills necessary to launch your career working in the wilderness, hence sharing your knowledge instructing others about this magical sport. The highlight of the class revolves around cracking the code on each and every visit to the stream, hence the mystery revealed! This revolves around the triad of strategies, tactics, and mechanics (casting and line control). This triad is emphasized heavily throughout the week and holds the key to solving all species of fish you may pursue. There is a celebration for graduation on the final evening of the class. It is an all-inclusive week of sharing and learning from the best professionals in our region of the country in their field. Literally, every guide school in the nation boast they have the best folks teaching at their schools. Just look at the overall qualifications and I think you will realize differences in short order! The school dates each season will begin on the second Saturday of March, April, May, June, September, October, and November. The price for the week is $3,200 and includes all accommodations. Deposits in full at time of reservation and are not refundable for the class once signed up. In addition, veterans may qualify for the 911 GI Bill! Do not miss out on this opportunity of improving your skills to land your dream job guiding fly fishing trips! Call (828-736-1469) or email: flyfishingguideschool@gmail.com for more information. We will have a sheet we email to you for finding out some background information. Fill out the Reservation Form to better help us find out a little more information about you. Guiding for a living has many benefits if you love working with people from varying walks of life. Furthermore, it offers you the opportunity for you to hone your own skills simply by being on the water daily to learn your fishery. Spend time in the wilderness honing your skills with the income to support your passion! This all-encompassing week offers all food and lodging and top-level instruction. Furthermore, you will receive a fly casting handbook for assisting your journey of fly casting diagnostics. People skills to remain a positive cheerleader in all circumstances! Learning to recognize how much coaching to offer for the day. Learning to read water for boating routes and locating fishing lies. 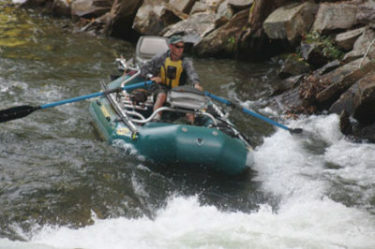 Oar frame rafts, jet boats, and/or drift boat skills for guided float trips. Line control and rod angles for various tactics. 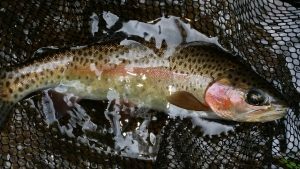 Learn when and how to fish nymphs, wets, dry flies, and streamers. Basic taxonomy of the major insect hatches for America. Single and double-handed fly casting instruction from Master Fly Casters through the FFI (Fly Fishers International). 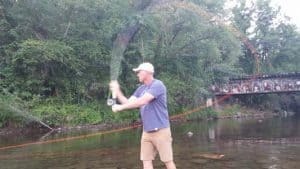 Fly casting diagnostics (teaching fly casting). Learn stream craft for adjusting quick as feeding behavior changes on the stream. Rod angles and line control for adjusting depth and speed. Learn proper hook sets and fish playing skills. Knots and rigging (fresh and salt water). Learn to be an effective communicator and reading when the client is saturated with enough information. Basic photography skills for your clients. Organizing your customer database and why that is important to your success. Implementation of social media for your online presence. Cover letters, references, and how to secure that first incredible summer job as a fly fishing guide. Insurance and permit requirements for a legit business operation. Learn where to further your personal knowledge of casting credentials for your journey.